Photo: Supporting the Diesel Dirt & Turf Expo: (From left), The Hon. Stuart Ayres MP, New South Wales Minister for Trade, Tourism & Major Events; Ms Fiona Scott MP, Federal Member for Lindsay, New South Wales; Councillor Karen McKeown, Mayor of Penrith; Event Manager Steve Zivkovich. Spotlight on Western Sydney as Construction Expo attracts Australian and international visitors. 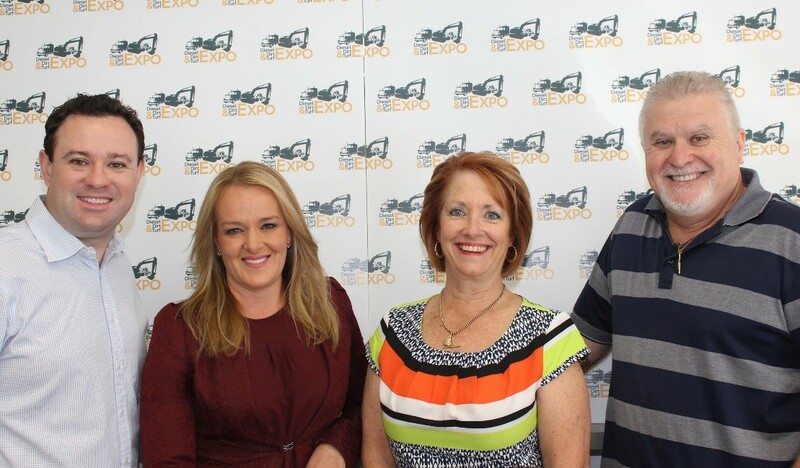 Community leaders have welcomed the Diesel Dirt and Turf Expo that will focus on the latest advances in equipment and resources designed to increase performance and productivity in the earthmoving, construction, and contracting industries. Representatives of Government have expressed their support for the Expo that reflects the dynamic growth and infrastructure development being experienced throughout the Western Sydney region. The Event is free and open to all visitors. It is being held from April 15th to 17th on the grounds and in the pavilion of the Penrith Panthers Club. “New South Wales is Australia’s Number One economy and nowhere is this more evident than in the rapidly growing business environment of Western Sydney … Our massive infrastructure agenda, including major transport projects, are improving investor confidence which is leading to commercial and residential growth in the region … It is a hugely busy time in this wonderful part of Sydney and there is no better exemplification of this than the Diesel Dirt & Turf Expo coming right here to Penrith. 0 Comments on "Government Sees Economic Benefits of Western Sydney Expo"